The breed of rabbits known as “Enderby Island” or just “Enderby” are descendants of rabbits taken from Australia and released onto subantarctic Enderby Island in the Auckland Islands group early in October 1865. Here they engendered a rabbit population which was to remain in isolation for nearly 130 years. 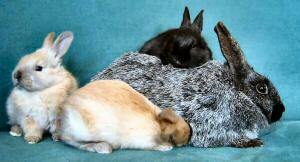 Most Enderby Island rabbits are a distinctive silver-grey in colour with an undercoat of dark slate blue. Their heads, ears and tails are much darker – often being black. 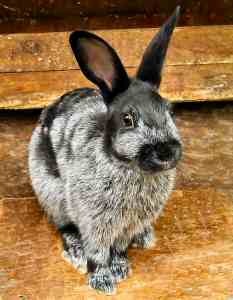 This unusual colouring has led to a suggestion that the original animals released were the French Argente de Champagne breed (Champagne Silver), but there is no hard evidence to support this rather romantic assumption – although it was widely believed until recently, when it has been suggested that the original rabbits the were released are more likely to have been British Silver Greys. As well as the silver-grey rabbits, a very small percentage are born cream or beige-coloured – a shade produced by a recessive gene. Enderby Island rabbits are of a moderate size and weigh around two kilograms. For several years all animals remained the property of the Rare Breeds Conservation Society of New Zealand with breeding programmes being undertaken by individual caregivers. Some animals are now available for purchase by private enthusiasts. Some have been exported to North America.